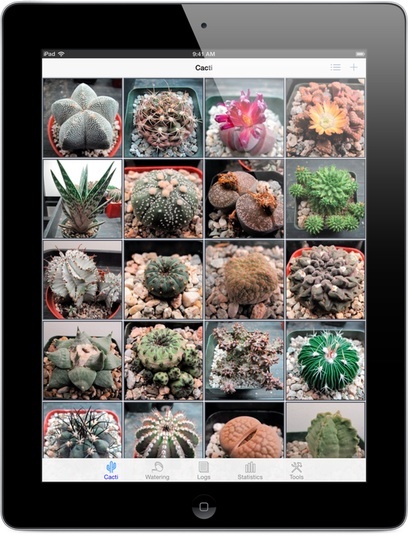 Track your cactus and succulent collection on your iPhone, iPad, or iPod touch! Cactus Album makes keeping track of your cacti and succulents easy. Track development of your plants throughout their lives, on your iPhone, iPad, or iPod touch! Want to track cacti on your PC? Cactus Album for PC is now available! Looking for the Mac version? Cactus Album for Mac is now available! Transfer the complete database between devices (iPad / iPhone / iPod) over WiFi via Cactus Album CDBI-format support and AirDrop. CSV format support to import / export your Cactus Album database to and from desktop spreadsheet applications. Cacti Report export feature. View your collection on your computer’s web browser. Great for keeping track of your collection for inventory or insurance purposes. Please note that Cactus Album does not come preloaded with any photos, nor does it include any plant care information and so forth. It only tracks information and displays photos you’ve added yourself. Send me an email at if you have any questions, to request features, or report any issues. Check the Cactus Album Frequently Asked Questions page for quick answers to commonly asked questions. Not sure if Cactus Album is for you? Try the free Lite version available on the App Store now. The Lite version allows you to store up to 3 cacti, 3 watering schedules, and 3 log entries with 3 photos each. The Lite version includes database backup and export, allowing easy upgrade to the full version. The full version has no such limitations.